Hello Friends! For the last few weeks, I have really been getting into making more bread. My husband bought me a baking stone!! I have always wanted one and I am having so much fun! I have been making a few simple breads (smaller in size so they get eaten quickly) and I decided to do a braided bread…mainly because I love to braid. The recipe is very simple and if you can do a three-strand braid, you should have no problem. You can do with without a baking stone as well. Enjoy! In a small sauce pan, combine milk, water and 1/4 cup of butter. Heat until butter has melted and the liquids are warm (not hot). In a large bowl combine bread ingredients, including liquids, mixing until all ingredients are combined (If the mixture is too dry, add more water/too wet, add more flour). Let mixture rest for 10 minutes (makes for easier kneading) and then knead until dough is soft and elastic. Form dough into a ball and place in a large, greased bowl. Spray the top of the dough as well and cover dough with saran wrap. Let dough rest for 1 hour. Preheat the oven to 350 F. If you are using a cooking stone, you want to preheat for at least 40 minutes. If you are not using a cooking stone, preheat for at least 15 minutes. For each ball of dough, roll ball out into a large rectangle. Using the long side, roll dough into a tight rope. Let each rope rest for at least 5 minutes before rolling them into longer thin ropes. Make a long braid out of the ropes of dough, pinching the ends at each side. Coil the braid, tucking the ends under the loaf. 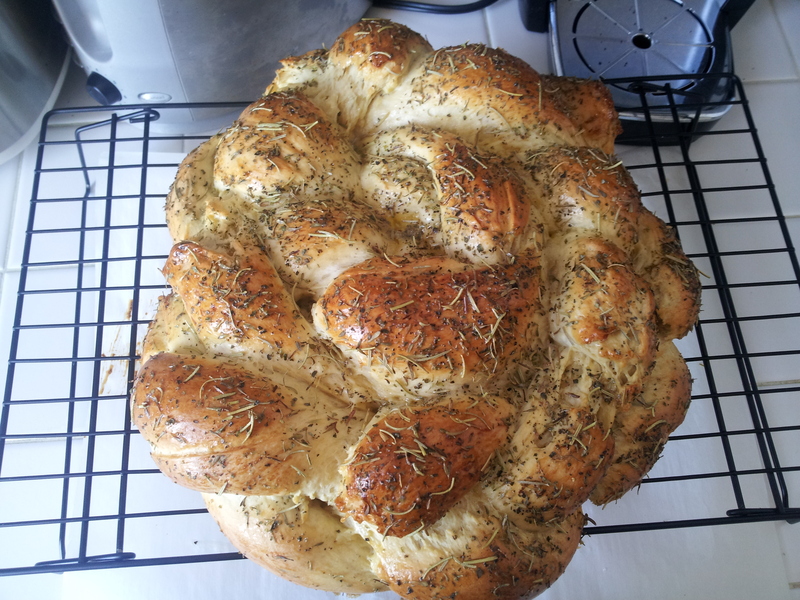 Place coiled braid on a parchment paper ( and a cooking sheet if not using a baking stone) and spray with cooking spray. Allow bread to rise for 30 minutes. In a bowl, combine egg yolks with water and brush the loaf. Bake bread for 20-30 minutes or until golden brown. After taking the bread out of the oven, gently brush the top with melted butter. I hope you enjoy the bread!! Made this the other day and it was fantastic, I even forgot the egg and it was still great…. Making it again today for my mum (egg included). Thank you so much for a wonderful recipe!